With its prairies, badlands, foothills and mountain vistas, Alberta South is an ideal location to go golfing. Southern Alberta’s diverse terrain and desirable climate give golfers everything that they would want in their golf game. Golfers can play on the edge of beautiful mountain scenery in Waterton Lakes National Park, hit a ball off the edge of a coulee in the badlands at Drumheller, or get to the cup on a large rolling green in sage-and-thistle territory in a town like Vauxhall or Bassano. Urban centres, such as Lethbridge and Medicine Hat in Alberta South also provide challenging golf courses. So don't wait another minute longer, go golfing in Alberta South. Staff at the Crowsnest Pass Golf and Country Club in Blairmore, Alberta, have been hard at work upgrading the course, the clubhouse menu and promotional offers. The Lee Creek Golf Course is an immaculate course that is often free from crowds. Golfers will enjoy this Les Furber-designed hidden gem. On March 22, Crowsnest Pass Golf and Country Club (CNPGCC) welcomed a new pro, Peter Stewart, to the helm. 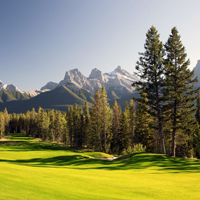 Bask in long summer days on the golf course at award-winning Silvertip Resort. Lee Creek Valley Golf Course in Cardston is both economical and suitable for golfers of all experience levels.